Enable: used to enable or disable Snort on the selected interface. Snort is enabled on the interface when this box is checked. Interface: used to choose which physical firewall interface this Snort instance protects. Description: used to provide an optional friendly name for the interface. Send Alerts to System Logs: when checked, all Snort alerts will be copied to the system log on the firewall. Block Offenders: when checked, Snort will automatically insert a firewall block of the host generating an alert. Kill States: when checked, Snort will kill all existing state table entries for the IP address it blocks. This should generally be enabled (box checked). Which IP to Block: this determines which IP address extracted from the packet that generated an alert will be blocked. The choices are SOURCE, DESTINATION or BOTH. BOTH is the recommended default. Search Method: used to select the pattern matcher algorithm used by Snort in the signature detection engine. Home Net: selects the network Snort will use as the HOME_NET variable. Default is the recommended choice and contains the firewall WAN IP address and WAN gateway, all networks locally-attached to a firewall interface, the configured DNS servers, VPN addresses and Virtual IP addresses. 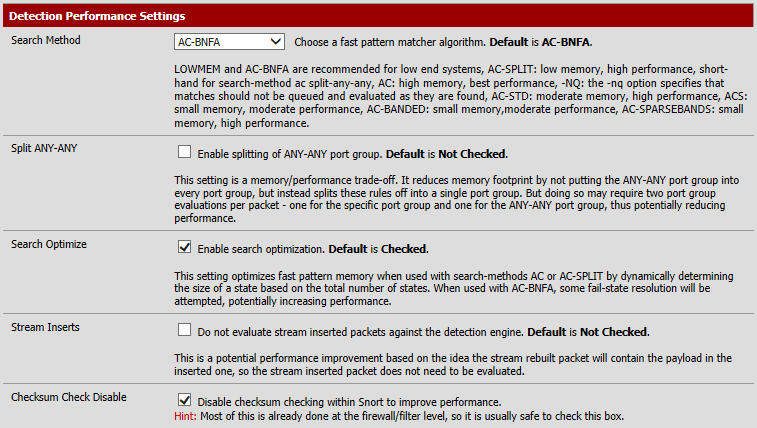 Additional HOME_NET networks may be created on the IP LISTS tab, and then return to this tab to assign them to the Snort interface by selecting the appropriate list in the drop-down selector. View the contents of the selected list by clicking the View List button. External Net: selects the network will use as the EXTERNAL_NET variable. Default is the recommended choice and contains all networks not included in HOME_NET. Create additional EXTERNAL_NET networks on the IP LISTS tab, and then return to this tab to assign them to the Snort interface by selecting the appropriate list in the drop-down selector. Pass List: selects the networks and IP addresses that Snort will never block. These represent “trusted hosts”. Even if a trusted host generates a Snort alert, it will not be blocked if the IP address is on a Pass List. The default Pass List contains the same addresses as HOME_NET. Create additional pass lists on the IP LISTS tab, and then return to this tab to assign them to the Snort interface by selecting the appropriate list in the drop-down selector. Snort must be restarted on the interface when making changes to the Pass List. View the contents of the selected list by clicking the View List button.